ICHIMOKU CLOUD SCAN — s.c.a.n. Hello all,it's been a while....I am trying to tweak this scan below. I am looking for stocks that are just above the cloud or changing over to go above.. Thank you for your help. Nicko p.s. Hello Mark. Ekwong, Thank you very much!! At first, I was confused by ekwong's scan, but now I think I am starting to realize that this is very nicely done. I thought that "and [Daily Above Ichimoku Cloud = 1]" is separate from price crossing above the cloud and could not be combined. If you run those two scans separately, you get different results. 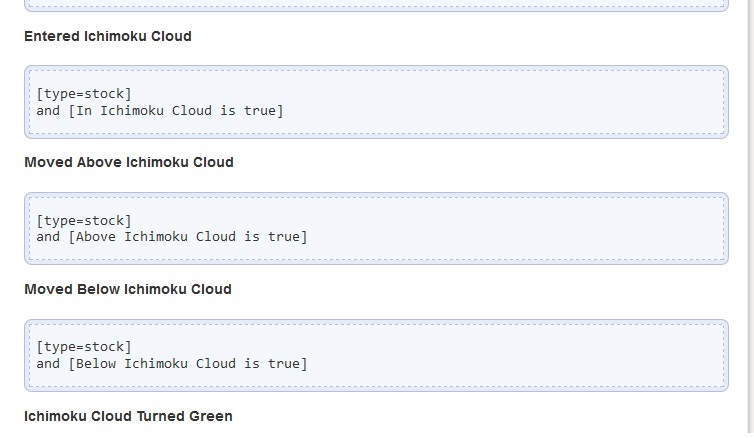 The "and [Daily Above Ichimoku Cloud = 1]" clause returns 68 results. This returns results that are "way" above the cloud. The "price crossing above the cloud" scan returns 2 results. ekwong's scan returns 7 results. It returns results moving above red (weak) and green (strong) clouds. Nicko asked for "just" above the cloud and "or changing over to go above". The "just" above the cloud suggests that it recently moved above the cloud, which ekwong's scan does well. Crossing above the cloud is an Ichimoku signal though it is among the weaker signals. Simply being above the cloud is not a signal. Kevo, thanks for the comment, scan is working VERY well! TO ALL>>>>HAPPY THANKSGIVING!! !